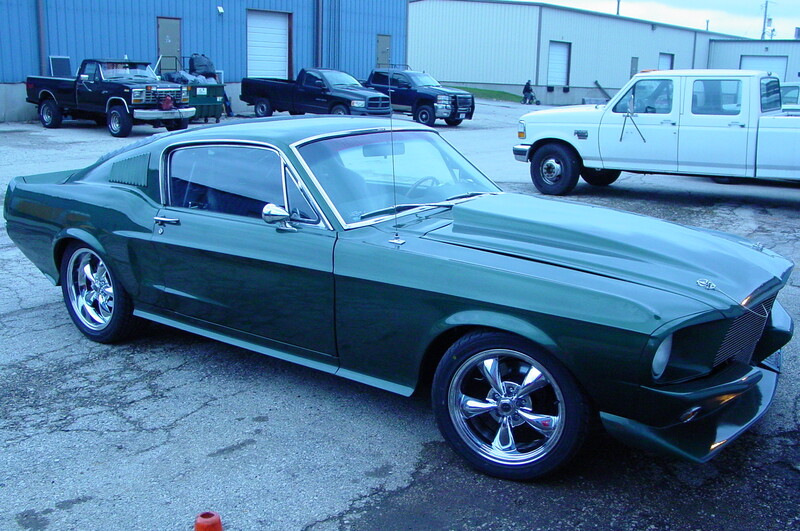 And then the pleasure to be able to build his Mustang the way he's always wanted it. The original plan was to install a 4 link back half under the Mustang. When we received the car we noticed that it was in need of a lot of rust repair. It was Mustang rusty. Rockers, inner and outer, inner front wheel wells, and a complete floor. When the rust repair was completed we were able to start installing the rear 4 link. This is a competition 4 link with coilovers and a ford 9" posi rear. Next we installed tubular upper and lower front control arms with coilovers . Than we build and welded in place the roll cage to make sure that everybody is safe and secure. Tinning the interior was fun due to the tight confines of a caged car. As you can see it turned out fantastic. Marks Mustang now handles as if it were on rails and goes down the road straight and fast.